Dr Shemer and Dr Tracey Gilchrist with big sisters Issra and Fadwa and Quads Omar, Uthman, Amr and Hend. Babies Omar, Uthman, Amr and Hend arrived earlier this month, at 32 weeks, to mum Hind and dad Mouhamad. Hind said she suspected she was having twins due to her family having a number of twins but received a big surprise when she had her first ultrasound. Hind was referred to the Women’s specialist Multiple Pregnancy Clinic and monitored throughout her pregnancy, having scans every two weeks which increased to two scans a week towards the end of her pregnancy. Dr Scott Shemer said Hind had an almost perfect pregnancy. “We aim to get a Quad pregnancy to 32 weeks but it is always a balance of when to deliver them. In fact, 70 per cent of quadruplet pregnancies end up delivering prior to this time. We could see that one placenta was starting to fail and Hind had high blood pressure from an early stage, however with medication and extremely intensive surveillance Hind fortunately reached the 32 week mark,” Dr Shemer said. All babies were admitted to the special care unit, but they did not require breathing support, a common need for small babies that deliver preterm. Now, they just need to put on weight before going home soon. 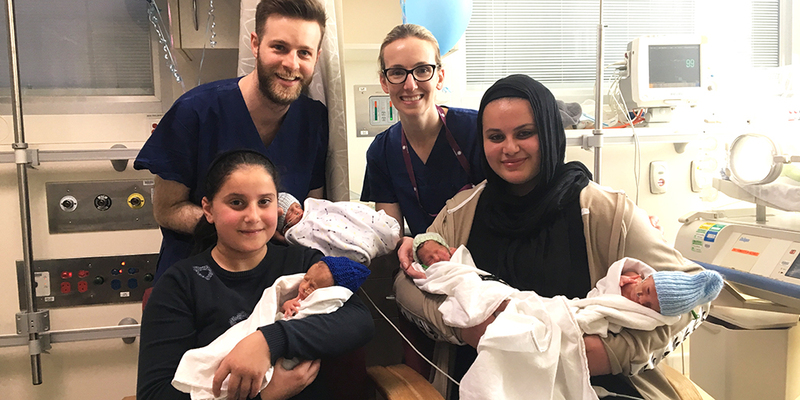 “We thank Allah, for a beautiful blessing and a big thank you from my husband and I to Dr Scott and all the staff at the Women’s who helped deliver and care for my babies and I,” Hind said. The babies were doing so well, they have been transferred to a hospital closer to the family’s home. Quadruplet pregnancies have become rarer in recent years as the Australian IVF sector has modified their practices and defaulted to usually transferring only a single embryo. The Women’s obstetricians and paediatricians led the way in calling for change due to concerns about the rising rate of high risk pregnancies associated with multiples which most often leads to preterm birth, requiring the babies to receive intensive care treatment and facing a much higher risk of long-term health problems. Only about three sets of quadruplets are born with all babies surviving, each year in Australia.